Weligama is a town on the south coast of Sri Lanka. Located in Matara District, Southern Province, Sri Lanka. The name Weligama, literally means “sandy village” . Which refers to the area’s sandy sweep bay. It is approximately 144 kilometres (89 miles) south of Colombo. Weligama is where trade winds carried legendary explorers like Marco Polo. Past Sri Lanka’s soaring southern cliffs on some of history’s most celebrated nautical journeys. 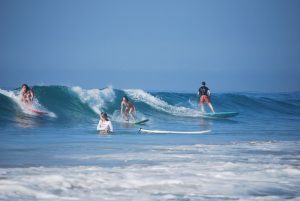 Weligama has become the most celebrated among Sri Lanka Beach Resorts. Along this fabled island’s palm fringed shores. It is a popular tourist destination and hosts several boutique hotels. Including an off shore islet known as Taprobane. Which houses a villa constructed by the French Count de Mauny. Is currently owned by Geoffrey Dobbs. It was the birthplace of the scholar monk Weligama Sri Sumangala. Weligama is recognised for its beeralu lace-making. First introduced by the Portuguese in the 16th century. Lace-making has remained a traditional handicraft along the coastal area of Weligama. With a number of households producing crochet and tatting lace. The area is also famous for its distinct stilt fishermen. Who erect a single pole in the chest-deep water on the beach, just a few meters off-shore. 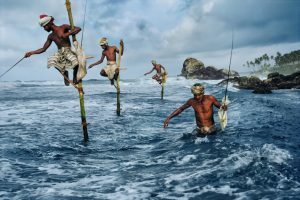 Where they perch on a cross bar and using bamboo fishing rods cast their lines out beyond the surf break to catch small fish.